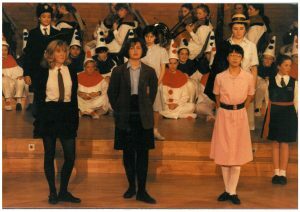 As well as a School party, the Centenary was honoured during a number of dramatic and musical performances of ‘Northern Lights’. 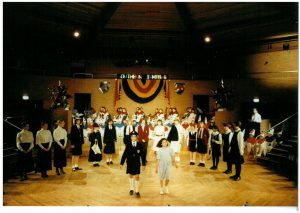 Miss Boucher devised the story while Sasha Manning wrote the musical score. 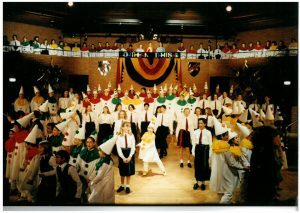 There were endless colourful costumes and a simple backdrop using fabric in School colours. 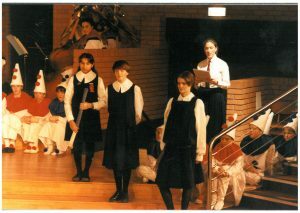 Juniors, Seniors, Sixth Formers and Old Girls participated in this production that carefully demonstrated the School’s history and aspects of School life in 1990. 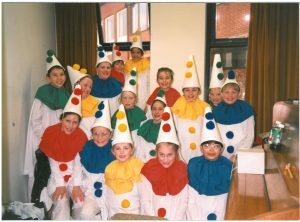 Troupes of seaside Pierrots from 1890 helped present-day pupils celebrate before the finale where every member of the audience lit a torch to symbolise our School motto ‘Towards the Light’. In addition to parties and performances, a special artwork was commissioned to commemorate the Centenary. Textile Artist Marta Rogoyska created a striking tapestry that incorporates fantastic patterns, shapes and colour. This artwork still hangs in the central stairwell along with a series of framed watercolour and collage designs. 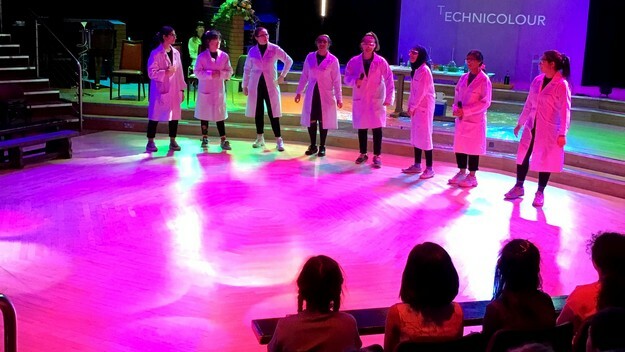 We now offer creative Year 7 pupils an opportunity to enroll onto the Arts Award Bronze programme. 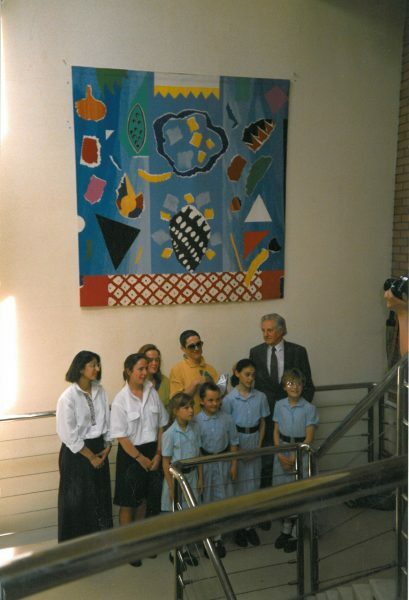 The tapestry and supporting designs are used as a starting point for one of the programme’s units looking at inspirational artists and their work. 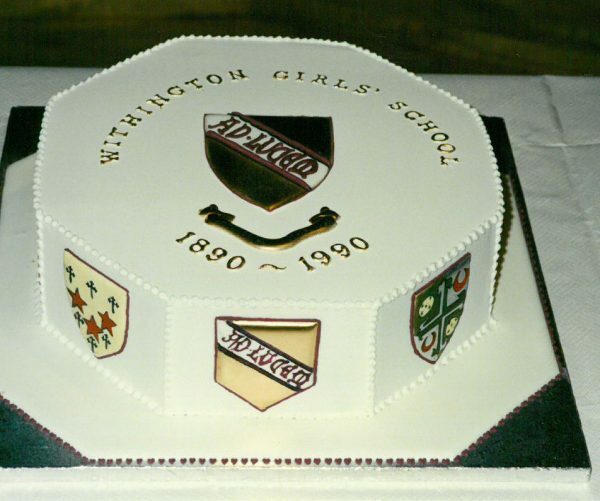 The 100 Year Anniversary was finally celebrated by the publication of the book ‘Withington Girls’ School: a celebration of the first hundred years’. 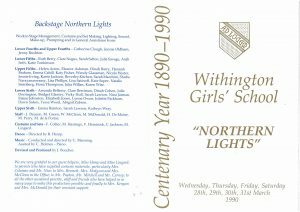 Since the Centenary, we have enjoyed commemorating 125 Years of Withington, and this milestone has also been marked with the book ‘Towards the Light’. You can find out more about this publication here. 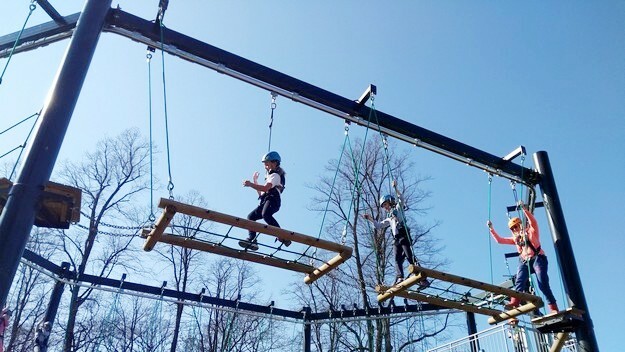 A quote from the Centenary Newsletter states; ‘This year has been a very happy one for the school. 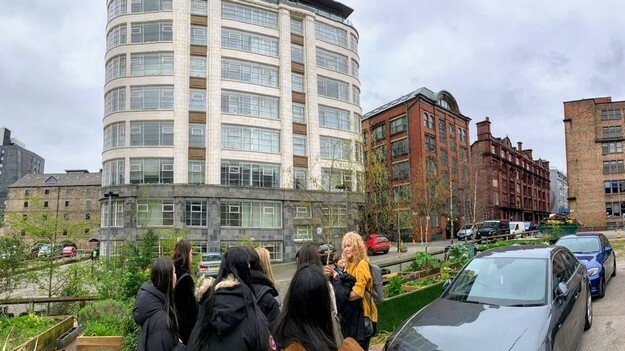 Now we look forward to an equally happy and busy future.’ This sentiment remains the same to this day.